A proposed space mission to detect gravitational waves would split atoms to search for minute acceleration changes caused by passing space-time ripples. In this artist's illustration, the red line represents a laser beam connecting the two spacecraft, and the white stars represent the atom interferometers. The existence of gravitational waves, or ripples in space and time, has long been predicted, but the elusive phenomenon has eluded scientists for decades. Now researchers are proposing a new method to detect these cosmic wrinkles that relies on the quantum nature of atoms. Gravitational waves are a consequence of Einstein's general theory of relativity, which posits that massive objects warp the space-time around them, causing other objects, and even light, to travel along curved paths when they pass nearby. Objects with very strong gravitational fields, such as black holes or dense stars orbiting in binary pairs, should create gravitational waves so powerful they are detectable here on Earth. "No one's yet seen a gravitational wave, but that's not the reason most of us are really excited about it," Graham told SPACE.com. "We're all basically certain gravitational waves are there. But you could build a gravitational wave telescope and use gravitational waves to look at the whole universe." By studying the information embedded in these space-time wrinkles, he explained, scientists could learn about the objects that made them, and probe exotic phenomena such as black holes, neutron stars and other dense objects. They could also explore the mysteries of gravity, which is still not well understood. "You might learn something about gravity in what's called the 'strong field regime,' where gravity is far beyond the strength of anything we can make in the lab," Graham said. Current experiments hunting gravity waves look for distortions to the lengths of long walls caused when space-time ripples pass through them. The most sensitive gravity wave detector is LIGO (the Laser Interferometer Gravitational Wave Observatory), which comprises three detectors in Louisiana and Washington. Each has two arms, between 1.2 miles (2 kilometers) and 2.5 miles (4 kilometers) long, that are perpendicular to each other. If a gravitational wave passed through, it should stretch one arm, while shortening the other, depending on its orientation. Using sensitive lasers whose light is split — one beam down one arm, another down the other — LIGO is equipped to detect minute changes to the length of its walls. However, this detection method, called laser interferometry, is very susceptible to laser noise, or random fluctuations in laser light, that could simulate the effects of gravity waves. To get around the problem of laser noise, Graham and his colleagues want to use atoms instead of lasers. Instead of splitting a laser beam in two, the scientists plan to essentially split an atom — a prospect made possible by quantum mechanics. According to this theory, particles are less like tiny marbles and more like hazy clouds of probability described by equations called wave functions. They don't definitively exist in a certain place at a certain time unless pinned down by direct measurements. For atom interferometry, the wave function of an atom is split. "The atom is in a weird quantum mechanical combination of here and there," Graham said. "If a gravity wave flies through this interferometer, then the two halves of the atom will accelerate with respect to each other because of this gravity wave." To measure this acceleration, the experiment would use lasers, potentially introducing the laser noise problem all over again. To avoid this difficulty, the researchers want to launch two atom interferometers on two satellites that would orbit a set distance apart. "If you shine the same laser beam simultaneously on the two atom interferometers, then you get the same noise read into both of the atoms, but the gravitational wave signal is not the same at the two spots, so that's the key," Graham said, adding that the laser noise can be compared and subtracted out of the signal. The experiment works best on spacecraft, rather than on the ground, because the normal vibrations and shaking of the Earth could contaminate measurements made in ground-based detectors. 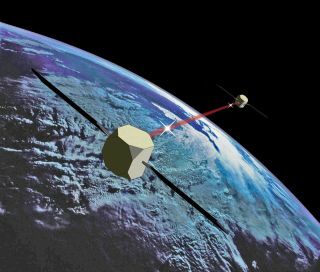 The researchers estimate such a mission would cost between $100 million and $1 billion — not a bargain, though significantly cheaper than proposed space-based laser interferometers, which would require three satellites, not two. A planned joint U.S.-European gravity wave-hunting laser interferometer space mission called LISA (the Laser Interferometer Space Antenna) was canceled in 2011 due to lack of funding. The scientists detail the atom interferometer concept in the April 25 issue of the journal Physical Review Letters.